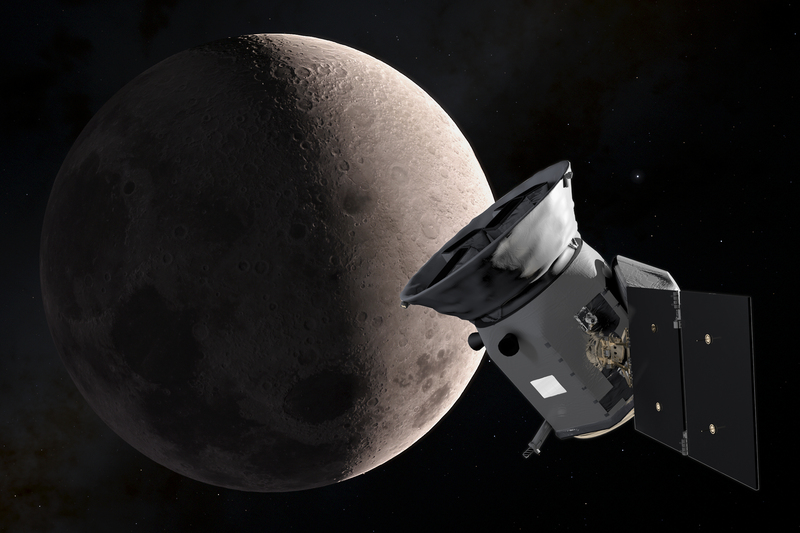 Exoplanet-seeking satellite developed by MIT swings by moon toward final orbit. Read this story at MIT News | The following is adapted from a press release by MIT and NASA's Goddard Space Flight Center. NASA’s next planet hunter, the Transiting Exoplanet Survey Satellite (TESS), is one step closer to searching for new worlds after successfully completing a lunar flyby on May 17. The spacecraft passed about 5,000 miles from the moon, which provided a gravity assist that helped TESS sail toward its final working orbit. As part of camera commissioning, the science team snapped a two-second test exposure using one of the four TESS cameras. The image, centered on the southern constellation Centaurus, reveals more than 200,000 stars. The edge of the Coalsack Nebula is in the right upper corner and the bright star Beta Centauri is visible at the lower left edge. TESS is expected to cover more than 400 times as much sky as shown in this image with its four cameras during its initial two-year search for exoplanets. A science-quality image, also referred to as a “first light” image, is expected to be released next month in June. TESS will undergo one final thruster burn on May 30 to enter its science orbit around Earth. This highly elliptical orbit will maximize the amount of sky the spacecraft can image, allowing it to continuously monitor large swaths of the sky. TESS is expected to begin science operations in mid-June after reaching this orbit and completing camera calibrations. NASA's Transiting Exoplanet Survey Satellite — TESS — will fly in an orbit that completes two circuits around Earth every time the moon orbits once. This special orbit will allow TESS’s cameras to monitor each patch of sky continuously for nearly a month at a time. Launched from Cape Canaveral Air Force Station on April 18, TESS is the next step in NASA’s search for planets outside our solar system, known as exoplanets. The mission will observe nearly the entire sky to monitor nearby, bright stars in search of transits — periodic dips in a star’s brightness caused by a planet passing in front of the star. TESS is expected to find thousands of exoplanets. NASA’s upcoming James Webb Space Telescope, scheduled for launch in 2020, will provide important follow-up observations of some of the most promising TESS-discovered exoplanets, allowing scientists to study their atmospheres. An artist’s illustration of TESS as it passed the moon during its lunar flyby. This provided a gravitational boost that placed TESS on course for its final working orbit. TESS is a NASA Astrophysics Explorer mission led and operated by MIT in Cambridge, Massachusetts, and managed by NASA’s Goddard Space Flight Center in Greenbelt, Maryland. George Ricker of MIT’s Kavli Institute for Astrophysics and Space Research serves as principal investigator for the mission. Additional partners include Orbital ATK, NASA’s Ames Research Center, the Harvard-Smithsonian Center for Astrophysics, and the Space Telescope Science Institute. The TESS science instruments were jointly developed by MIT’s Kavli Institute for Astrophysics and Space Research and MIT’s Lincoln Laboratory. More than a dozen universities, research institutes, and observatories worldwide are participants in the mission. 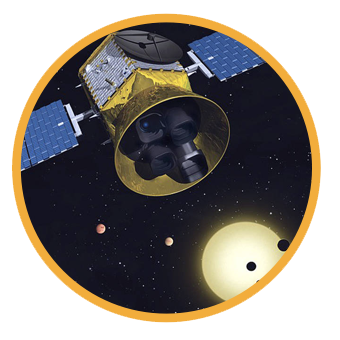 Transiting Exoplanet Survey Satellite (TESS) is an Explorer-class planet finder. In the first-ever spaceborne all-sky transit survey, TESS will identify planets ranging from Earth-sized to gas giants, orbiting a wide range of stellar types and orbital distances. The principal goal of the TESS mission is to detect small planets with bright host stars in the solar neighborhood, so that detailed characterizations of the planets and their atmospheres can be performed. 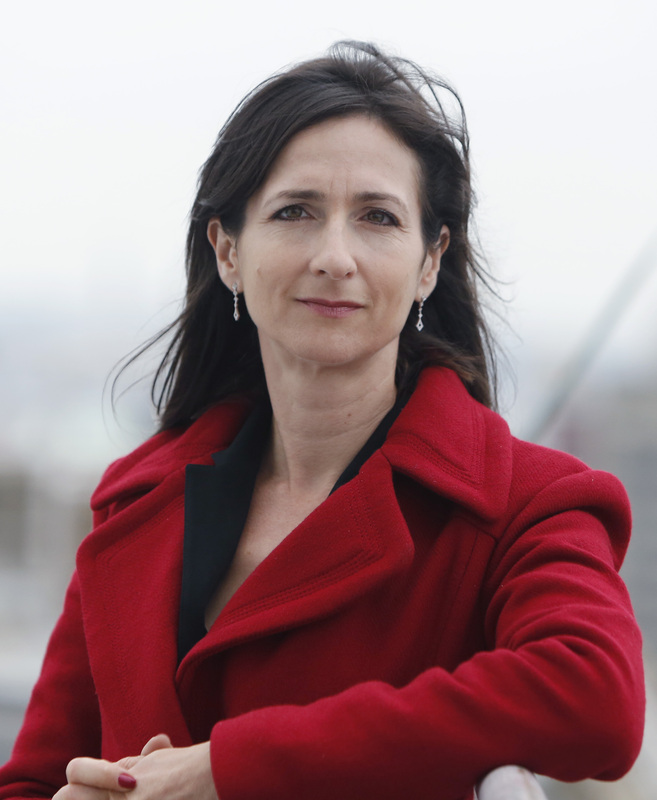 Sara Seager is a planetary scientist and astrophysicist at the Massachusetts Institute of Technology where she is a Professor of Planetary Science, Professor of Physics, Professor of Aerospace Engineering, and holds the Class of 1941 Professor Chair. She has pioneered many research areas of characterizing exoplanets with concepts and methods that now form the foundation of the field of exoplanet atmospheres.